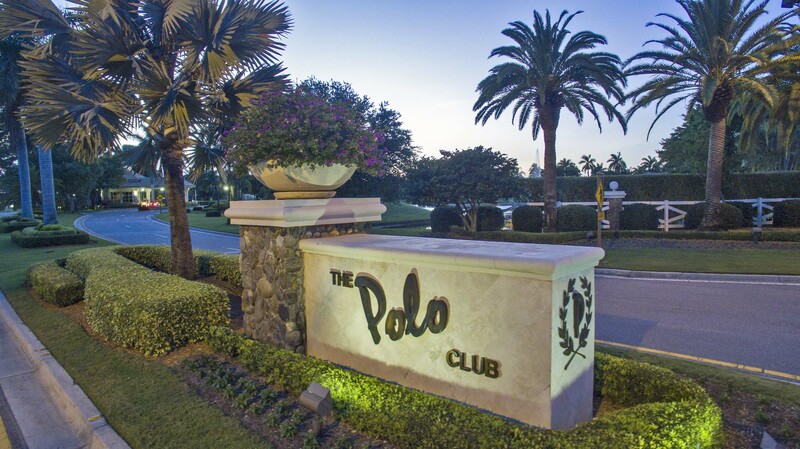 The Polo Club of Boca Raton is located on the West side of Military Trail North of Clint Moore Road in Boca Raton, Florida. This gorgeous gated community, established in 1986, offers an ideal resort ambiance that is enhanced by a spectacular 90,000 square-foot clubhouse featuring banquet facilities, health spa and indoor racquetball courts. There are 23 distinct subdivisions in The Polo Club of Boca Raton to meet every age and every lifestyle. Whether you are retired, are a working professional or have kids at home, you will certainly enjoy the vibrant community, luxury homes and resort-style amenities that The Polo Club of Boca Raton has to offer. The 1,300 homes in The Polo Club of Boca Raton range from four-plex condos through luxury estate homes anywhere from 2,000 to 10,000 square feet, so there is something for everyone here. Memberships available at The Polo Club of Boca Raton are Golf and Tennis, as well as a mandatory Social Membership which helps foster the community atmosphere. For a private tour of Polo Club of Boca Raton and other Boca Raton Luxury Home Communities, please contact us at Mizner Grande Realty. We specialize in South Florida's finest properties.